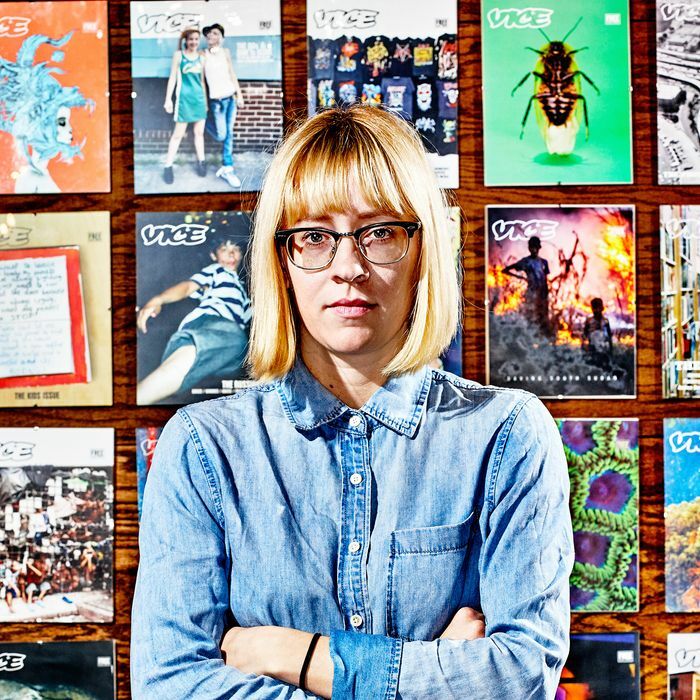 When Ellis Jones was named editor-in-chief of Vice magazine in February, she received a flood of emails from aspiring contributors who opened their pitches with a crucial error. “They were all like, “Dear Mr. Jones …,” she says between sips of a Narragansett poured from the steady-flowing tap at the Gutter, a divey Williamsburg bowling alley just a few convenient blocks from the Vice headquarters. Here, Jones partakes in a weekly bowling league with a group of dude friends. They’re fresh off a big loss. “People who haven’t met me always assume I’m a dude,” she says. But even more than that, Jones’s mission is to preserve the prestige of a print magazine that now threatens to become a vestigial organ within a company full of lucrative digital and video properties. Vice recently announced it’ll begin airing a daily news show on HBO, and some speculators think the company could go public at a valuation of more than a billion dollars. To make the magazine stand out, Jones is focused on adding more literary and capital-J Journalistic weight to Vice’s pages. When she took the reins, she made an executive decision to do away with the magazine’s fashion coverage, opting instead to use those pages for photojournalistic spreads. In her first issue atop the masthead, Vice ran a 6,500-word investigation into the killing of a transgender Filipina woman by a U.S. marine, along with a new piece of fiction by ex-Believer editor Heidi Julavits. She has signed up a number of new contributing editors, among them novelist and Guggenheim fellow Clancy Martin and investigative reporters Ken Silverstein (of Harper’s and the Intercept) and Jean Friedman-Rudovsky. She’s also recruited young literary talent — upcoming issues will include a new “gonzo self-improvement” column by ex-Hairpin editor Edith Zimmerman and a feature on the extinction of starfish by Nathaniel Rich. And like any good old-guard print-magazine editor, Jones has a meager 19 tweets to her name. Jones worshipped the magazine as a college kid in her native Atlanta, thanks to a crew of older friends. After reading girly glossies like YM and Seventeen as a teenager, Vice felt like like “the total opposite of what I was used to … nothing like what you would have seen in more popular magazines back then.” She liked the magazine’s anti-mainstream sensibility so much that she got an internship, thanks to the connections of one of the aforementioned older pals. At that point, Vice was still primarily a print magazine with a fledgling website. Jones climbed the editorial ladder quickly. She left the magazine for a brief stint as chief of staff at the Daily Mail’s online U.S. offices, but found it unsatisfying and returned to an executive editor’s job at Vice. When her predecessor, Rocco Castoro, left Vice after abruptly announcing his departure at a media panel, Jones was tapped to replace him. (“I wasn’t part of that conversation,” says Jones, who’s still friendly with Castoro.) His duties were essentially split into two parts: digital and print. Vice U.K.’s Alex Miller took on the new, grandiose, digital-focused title of Global Head of Content, but Ellis’s appointment garnered the news headlines: “Jones will be the first female editor-in-chief in VICE’s 20 year history,” the press release announced.